His music has been performed worldwide by such eminent artists as Wolfgang Holzmair,Sanford Sylvan, Paul Sperry, Patrick Mason, Thomas Meglioranza, William Ferguson, Rufus Müller, Robert Osborne, Juliana Gondek, Susan Narucki, D’Anna Fortunato, Tara O’Connor, Eugenia Zukerman, Benjamin Verdery, David Starobin, the St. Lawrence, Enso and Rubens String Quartets, Los Angeles Guitar Quartet, Cavatina Duo, Arc Duo, Brasil Guitar Duo, Pearl and Gray Duo, Clayton Haslop and Jack Sanders Duo, Saturday Brass Quintet, and orchestras such as the Fresno Philharmonic and the Springfield (MA and MO) and Amarillo Symphonies. Leisner’s complete works for flute and guitar have been recorded by the Cavatina Duo on the much acclaimed Acrobats album for the Cedille label, and he himself recorded his complete solo guitar works on Self-Portrait for Azica. Other works currently available on CD are on the SonyClassical, Dorian, Centaur, Town Hall, Signum, Acoustic Music, ABC, Athena, Fleur de Son and Barking Dog labels. Works and commissions include Love Dreams of the Exile for the flute/guitar Cavatina Duo and the Avalon String Quartet, Das Wunderbare Wesen for baritone Wolfgang Holzmair and cello, West Wind for tenor William Ferguson and guitar, A Timeless Procession for baritone Holzmair and string quartet, Away for the Arc Duo, Of Darkness and Light for the Stones River Chamber Players, Vision of Orpheus for the St. Lawrence Quartet and Leisner (20th Century Unlimited series), Embrace of Peace for the Fairfield Orchestra, The Cat that Walked by Himself for the Los Angeles Guitar Quartet, Battlefield Requiem for solo cellist Laurence Lesser and the New England Conservatory Percussion Ensemble, Fidelity for tenor Bruce Fowler, baritone Robert Osborne and pianist Warren Jones, and Ad Majorem Dei Gloriam for the Saturday Brass Quintet. David Leisner also maintains a busy career as a concert guitarist, performing in recital and as a soloist with orchestras around the world. Winner of top prizes in international guitar competitions at Geneva and Toronto, he is a featured solo artist with Azica Records, and has recorded chamber music on the Telarc, Koch and Etcetera labels, and concertos for Naxos and Opus One. Leisner is currently the co-chair of the guitar department at the Manhattan School of Music and also taught at the New England Conservatory for 22 years. A regular composition juror for the BMI Student Composer Awards, he has also been a juror for the New York Youth Symphony’s First Works commissions. A graduate of Wesleyan University, he studied composition with Richard Winslow, Virgil Thomson, Charles Turner and David Del Tredici. for Orchestra 14:00 2(2 dbl. Picc.) 2 2 2 – 4 2 2 1; Perc. Str. 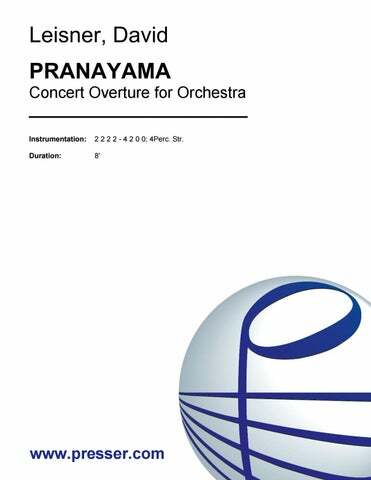 Concert Overture for Orchestra 9:00 2 2 2 2 – 4 2 0 0; 4(or 3)Perc. Str. Leisner’s songs have proved popular with the younger generation of American singers, and with reason. He has good literary judgment and shows imagination and taste in taking poems from disparate sources and putting them into cycles that trace emotional progress and develop dramatic shape. His prosody is excellent, and he sets words with an ear for sound, rhythm and sense… Best of all, Leisner has a gift for eloquently shaping a vocal line that is also grateful to sing… a gift for bringing a song around right at the very end, particularly in quiet closes that are at once surprising and inevitable. Leisner is a thoughtful composer who uses the orchestra with insight. The songs are ravishing. Very sophisticated music all of it. And clean and thin, and it sounds good. The songs of David Leisner are real songs: full of good melody, vocally “gracious” (as singers say), accessible to hearers, comparatively easy for pianists, and based on poetry of the highest order but of simple comprehensibility. Leisner’s respect for the voice and for the poet is exemplary. In short, his songs are good to sing and good to listen to. They work. Like his vibrant guitar performances, David Leisner’s music is colorful and deeply sensitive. His song cycle Confiding, to poems by women, is full of musical and literary interest and leaves an indelible impression upon the listener. Several passages are particularly haunting. David Leisner deserves serious attention. Leisner’s music was consumer-friendly, his forthright style simultaneously accessible and uncompromising. Spare texture, haunting colors, and fine solo efforts from first violin, oboe, trumpet and flute ignited the “Tango Solitaire.” “Waltz for the Old Folks” and “Ballad for the Lonely” invoked a soothing confluence of innocence and worldly wisdom, and “Samba!” made for an energetic close. Leisner applauded the orchestra and received a warm ovation. It is refreshing to find a work of such imagination and ingenuity that could be enjoyed by all types of listeners. 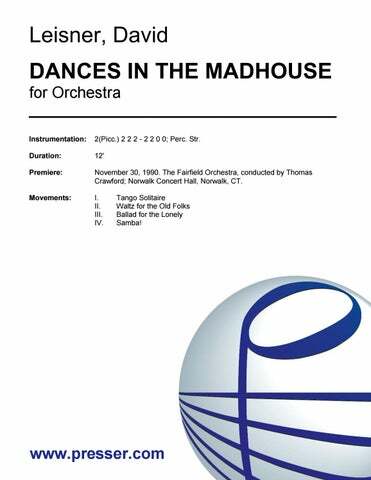 In fact, virtually every aspect of “Dances in the Madhouse” supports the contention that a composer needn’t sacrifice originality and quality for accessibility … a work of exquisite beauty. We heard what may be one of the most spellbinding new compositions I have listened to in many a moon – David Leisner’s “Dances in the Madhouse” … It is one of those small but delightful pieces which we all go to concerts hoping to hear: something new which pleases on its first hearing yet promises to yield further treasures the next time… a contemporary gem. David Leisner’s four Dances in the Madhouse are a potent addition to the repertory – giddy, attractive reinterpretations of traditional forms. …an ingenious and arresting compositional voice. …reveling in its coloristic and textural complexities. Labyrinths is a fine addition to the classical guitar repertoire. The five movements, “Shimmer,” “Shadow,” “Shiver,” “Shatter,” and “Shelter” translated these natural effects into musical patterns that slowly evolved and created musical gestures alternately mysterious, playful, and surprising, but always delightful. …an original and profoundly personal work … powerful, angry and moving music. These pieces are far superior to almost anything else being written for guitar today. Not many composers manage to be equally satisfying to the hands, the ear and the mind as Leisner has. The most challenging piece in the collection is the work by David Leisner [Sonata for violin and guitar], who contributed his guidance to this premiere recording. The fire and passion of the outer movements are wonderfully balanced by an almost prayerful central movement, characterized by unexpected modulations that are both technically clever and richly ambiguous in the best poetic sense. It is a brilliant piece, combining modern compositional elements with lucid and dramatic structures. Leisner’s exploitation of timbres and ranges of the instruments is very inventive. 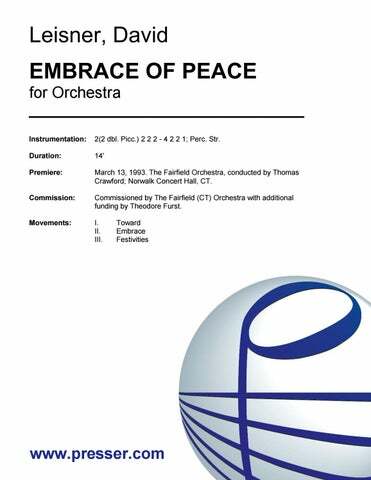 Guitarists who have the opportunity to work with a cellist must really investigate this piece.